I just wanted to thank you for one of the most enjoyable days of fishing I’ve ever had. 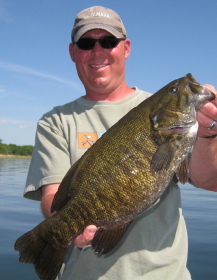 I caught my personal best smallmouth on the first fish and it got better and better from that point on. Catching two fish over 5 pounds and about 15-20 fish over 4 pounds was far beyond what I had hoped for. I never thought I would stop taking pictures of big fish because they were all big fish. You were right, my friends thought my pictures were of the same fish!! I appreciate the work you put in before the trip to know exactly where we could catch such quality fish. That didn’t happen by accident, you are an excellent guide, great fisherman, and on top of that you are a great guy to fish with.